Overview: There are a lot of things in life that just seem to go together naturally. Like peanut butter and jelly, or Scooby Doo and Shaggy. In the world of Marvel Comics, we get the super-hero pairing of Power Man and Iron Fist, as the two street-level heroes come together with their business partnership, Heroes for Hire. What makes this book stand out is the supporting cast surrounding the heroes. Characters were brought in from the two solo books, plus new characters such as receptionist Jennie Royce and Power Man’s love interest Harmony Young. The large cast made for all kinds of storylines and interactions between the characters, to a fault. So much of each story was spent developing the characters that it left little time (or pages) for super hero fighting! We get some interesting appearances in this book, such as a meeting with the X-Men to battle the Living Monolith. Sabretooth makes his second-ever appearance in comics in issue #66. (Hard to believe that he was an Iron Fist villain for nine years before he first crossed paths with Wolverine.) Sadly, there is one crossover missing, when Power Man and Iron Fist meet ROM (See Footnotes below). The book concluded with our heroes traveling to K’un-Lun, the magical city where Danny Rand received his training to become Iron Fist. What makes this Essential? : This is an interesting collaboration. Previous Marvel titles that added a character to the title (Captain America and the Falcon, Daredevil and the Black Widow) still were at the core a book with a title character and a supporting character. 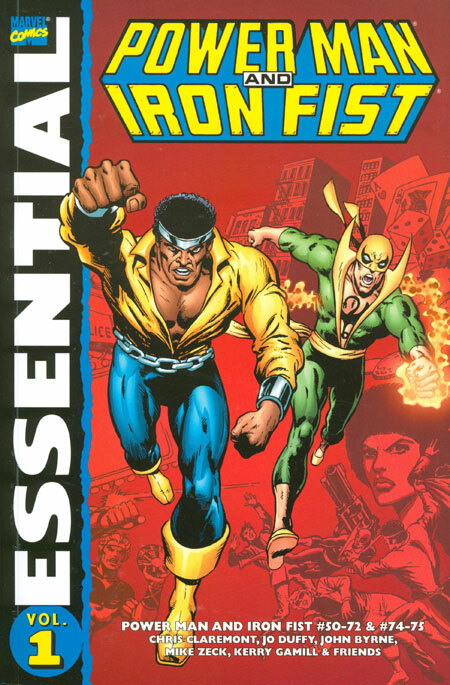 With Power Man & Iron Fist, both characters come into the book as equals, having been the stars of their own books. This combination makes for one of the first ongoing true team-up titles. In the grand scheme of things, this is not one of the most Essential Marvel titles of all time. But it’s still a solid read with a unique approach to the title characters as business partners. Footnotes: Power Man and Iron Fist #73 is not included in this collection. The story features our heroes teaming up with ROM, a licensed property from the late 1970s. Marvel no longer has the rights to ROM to reprint his appearances. Power Man and Iron Fist #50 is also reprinted in Essential Iron Fist Vol. 1. If you like this volume, try: the C.O.W.L. series from Image Comics. Launched earlier this year, C.O.W.L. stands for the Chicago Organized Workers League, the world’s first super-hero union. Set in the 1960s, C.O.W.L. has a contract with the city of Chicago, but they are in negotiations. The heroes are ready to go on strike, but the city refuses to give into their demands. At the same time, there is political infighting within their organization, as some heroes refuse to retire quietly. This is a very intriquing and complex book set in a fully developed world – think Watchmen meets Mad Men set in Astro City. The book is a long-time-in-development project from Kyle Higgins, with an assist by co-writer Alec Siegel and art by Rod Reis. The first trade paperback collecting the initial five issues was released at the end of October, so this is a perfect way to jump onboard. This entry was posted in Marvel Essentials, Power Man & Iron Fist and tagged Chris Claremont, Ed Hannigan, Iron Fist, Jo Duffy, Kerry Gammill, Power Man, Trevor von Eeden. Bookmark the permalink.